Mr.Lawrence Christy, Planning Director of the Tamil Rehabilitation Organization (TRO) registered his concern over the directive of the President to State armed forces to take over the management of welfare centres at a time when the TRO has been engaged in running such camps effectively and efficiently without showing discrimination to any community. Mr.Lawrence Christy pointed out that there are problems in Trincomalee, Batticaloa and Amparai as TRO has been asked to hand over relief materials to the Sri Lanka Army according to President's directive, sources said. Mr.Harim Peiris replied that President has issued this directive to ensure better co-ordination in providing relief to Tsunami victims in the country. However, he accepted that there are problems in implementing the President's directive in the northeast. Parliamentarian Mr.Kishore Sivanathan interrupted," President's directive to hand over the management of welfare centres to army is not a wise move at a time when TRO is doing a good job." He added all foreign aid coming to Sri Lanka should be equally distributed to North East without showing any discrimination. 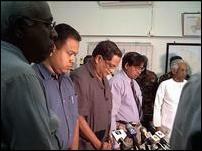 Parliamentarian Mr.Kanagaretnam said Mullaitivu district has been badly affected in the Tsunami disaster. LTTE and its Sea Tigers under the leadership of Special Commander Soosai have been rendering immense services to bring normalcy in the lives of affect people. The relief works in Mullaitivu district have been hampered due to lack of heavy vehicles, he pointed out. Mr.Tyronne Fernando, North East Provincial Governor accompanied by Mr.Harim Peiris Presidential advisor on Rehabilitation and Reconstruction paid his first official visit to Vavuniya Thursday. 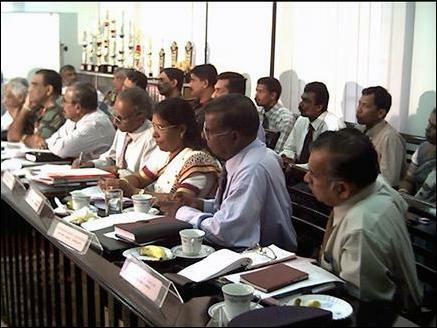 Government Agents of Mullaitivu, Killinochchi, Mannar, Vavuniya Messrs Imelda Sukumar, T.Rasanayakam, S.Visvalingam, S.Shanmugam and Jaffna Additional Government Agent explained the ground situation in their respective districts after Tsunami disaster. Vanni TNA Parliamentarians Mr.Sivasakthi Anandan, Kishore Sivanathan, Vino Noharathalingam, Sathasivam Kanagaretnam and Vanni SLMC parliamentarian and Minister for Vanni Development and Rehabilitation attended the conference. Vanni SLA commander Parami Kulathunge, Senior Police Superintendent Mr.D.J.Miskin and several security officials participated in the discussion, sources said. Mr.Tyronne Fernando thanked the LTTE for coming forward to work along with the government at national level in providing relief to Tsunami victims and rebuild the devastated coastal areas, sources said.